minor in comparison to his massive injuries, but probably not to his dignity, his tail wouldn't work. Through love and care Highway Will survived his leg surgery. He stayed as sweet and loving as the day Feline Friends picked him up. 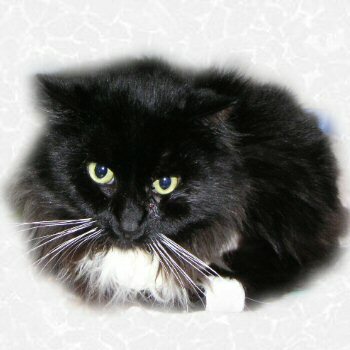 While he was happy to be in the Feline Friends program where he was safe and warm, he still lacked the special love of a Forever home. And then Chris came into Highway Wills life and said, "I would like to meet Highway Will and let him meet me. Will could be the royal king at my house. Maybe spoiled but he'd be respected and given daily gentle and loving care. He would never go hungry or scared and all his medical needs would be met. I would pet and talk to him everyday and try to understand his thoughts and wishes." CAN IT GET BETTER THAN THIS? WILL SAYS NO!!! On May 3rd, 2004, Will went home with Chris. Below is a copy of a letter written on behalf of Will. 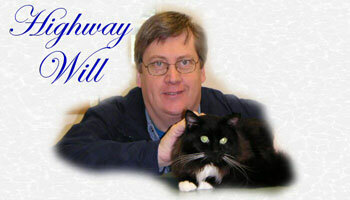 I can't thank you enough for the kindness from beginning to end and of course for adopting "Highway Will". I know that you will make the purrfect team together and that neither of you will want for much more. This is the perfect adoption and we are all very grateful for people like yourself. You've opened your heart and home to someone's "thrown away" treasure, and that takes a special person. 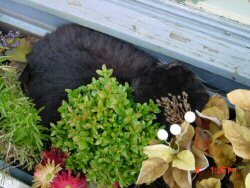 As hard as it is to let these special furchildren go, you made "Will and my" dreams come true. Thank you so much for all your kind words, pleasant phone calls and messages, donations, and for committing to one very special kitty.